What if a busy city street could double its functionality? - A-I-R, Inc. What if a busy city street could double its functionality? - A-I-R, Inc.
Q: What if a busy city street could double its functionality? A: Urban streets are underutilized infrastructures. Their singular function of transporting people in the most efficient way has resulted in an increase in the urban heat island effect1 , a cluttering of street furniture and lighting, and an inhospitable landscape for nature. The right-of-way affords the citizen of Phoenix with little more than a space for circulation. As the only true public realm in Phoenix, in the absence of a robust park system and public amenities, we need to take back the streets. Finding uses and occupancies for once neglected circulation space, whether roadways, sidewalks, or setbacks, will allow Phoenix to create a new kind of public space. But how do we facilitate both the increased use of this space while making it more hospitable at the same time? 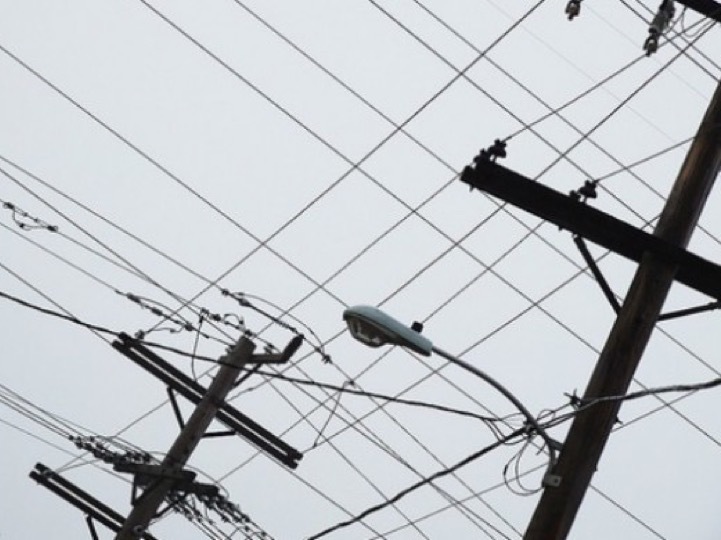 The desire for decentralized renewable energy will only increase with record high temperatures, as cooling loads at peak demand times tax centralized conventional power sources. How can we utilize the most abundant resource in Phoenix, sunlight, in combination with the massive expanses of concrete that comprise our gridded street system? Solar Streets™ posits that an elevated photovoltaic canopy can reduce the urban heat island effect while providing much needed shade to the people occupying the space below, all while decentralizing the power grid using renewable, passive energy systems. 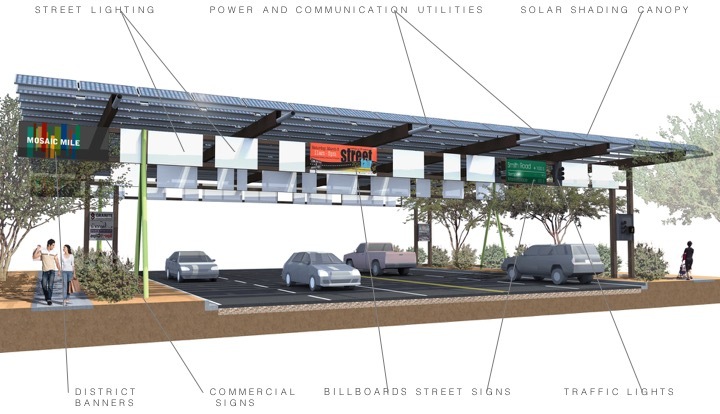 Along with the infrastructural benefits, these elevated canopies provide a unique identity for the neighborhoods in which they are located, allowing for signage and other urban elements, such as lighting and bus stops, to be integrated into the underutilized street infrastructure. 1 The Urban Heat Island Effect is the result of materials like concrete and asphalt absorbing heat during the day and re-radiating it at night, thus keeping nighttime temperatures higher than less developed areas with similar landscapes. The world is becoming increasingly warmer and drier. Our built environment must respond to these climatic shifts not as a crises but as an opportunity to develop more responsive integrated design solutions that advance the human condition in relation to the natural environment.